Item No. 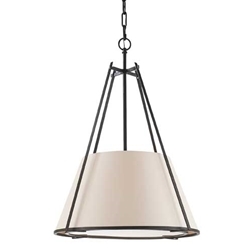 360 Conical Iron Pendant ceiling fixture that provides a diffusion of light with ivory parchment shade and canopy; 75 watts. Ideal for kitchen, dining or office lighting.